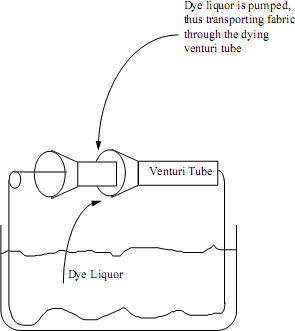 Dyeing can be performed using continuous or batch processes. Yarn dyeing is used to create interesting checks, stripes, and plaids with different-colored yarns in the weaving process. Substances which cause these changes are called dyestuffs. Yarn dyeing is used to create interesting checks, stripes, and plaids with different-colored yarns in the weaving process. In yarn dyeing, dyestuff penetrates the fibers in the core of the yarn. 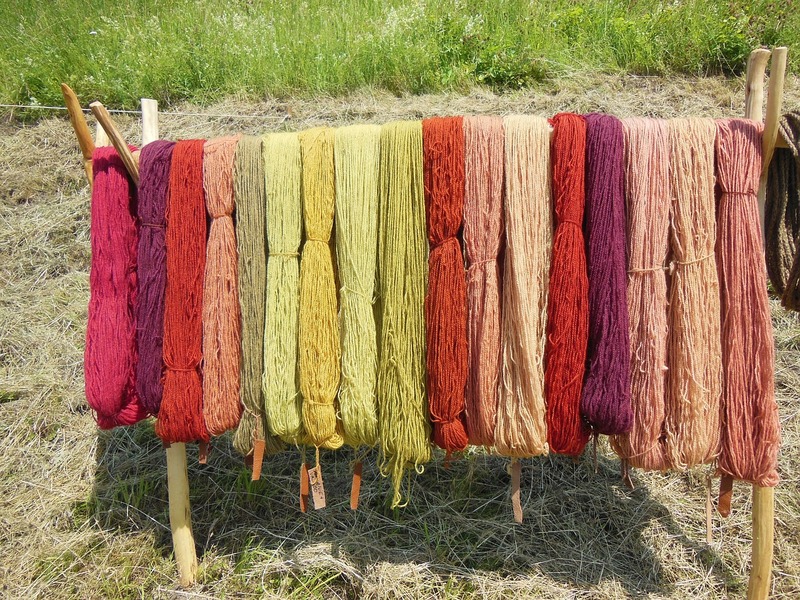 Some methods of yarn dyeing are stock, package, and skein dyeing. Stock dyeing dyes fiber using perforated tubes. 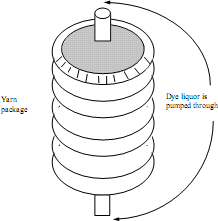 In package dyeing, spools of yarn are stacked on perforated rods in a rack and immersed in a tank where dye is then forced outward from the rods under pressure. The dye is then pressured back through the packages toward the center to fully penetrate the entire yarn. Most carded and combed cotton used for knitted outerwear is package-dyed. In skein dyeing, the yarn is loosely coiled on a reel and then dyed. The coils, or skeins, are hung over a rung and immersed in a dyebath (Corbman, 1975). The skein-dyed yarn is used for bulky acrylic and wool yarns. Typical capacity for package dyeing equipment is 1,210 pounds (550 kg) and for the skein, dyeing equipment is 220 pounds (100 kg). The most dyed fabric is piece-dyed since this method gives the manufacturer maximum inventory flexibility to meet color demands as fashion changes. In terms of overall volume, the largest amount of dyeing is performed using beck and jig equipment (Figure 11). Beck dyeing is a versatile, continuous process used to dye long yards of fabric. About 1,980 pounds (900 kg) of fabric can be dyed on beck equipment at a time. The fabric is passed in rope form through the dyebath. The rope moves over a rail onto a reel which immerses it into the dye and then draws the fabric up and forwards to the front of the machine. This process is repeated as long as necessary to dye the material uniformly to the desired color intensity. Other piece dyeing methods include jet dyeing and pad dyeing. Fabric can be jet-dyed (at up to 1,100 pounds (500 kg)) by placing it in a heated tube or column where jets of dye solution are forced through it at high pressures. The dye is continually recirculated as the fabric is moved along the tube. Pad dyeing, like jig dyeing, dyes the fabric at full width. The fabric is passed through a trough containing dye and then between two heavy rollers which force the dye into the cloth and squeeze out the excess (Corbman, 1975). Figure 11 illustrates the beck, jig, and jet methods for dyeing.